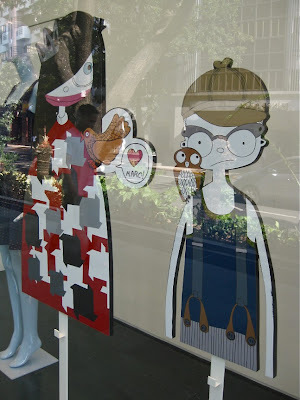 every time we're in greenbelt 5, we make it a point to walk by the marc by marc jacobs store. we like to look at the cute window displays. we especially like these characters above used to hang the bags! we want one!! or any accessory will do! well, guess what? we (or you) can actually win one! in celebration of marc by marc jacobs' 10th anniversary, the store is giving away its best-selling accessories! get a chance to win one of five collections! for more details, you have to go visit the store! promo period is up to june 15, 2011 so there's still plenty of time! go go go!